Benedict Arnold and the Rebels take advantage of the prosperous community of Skenesborough. 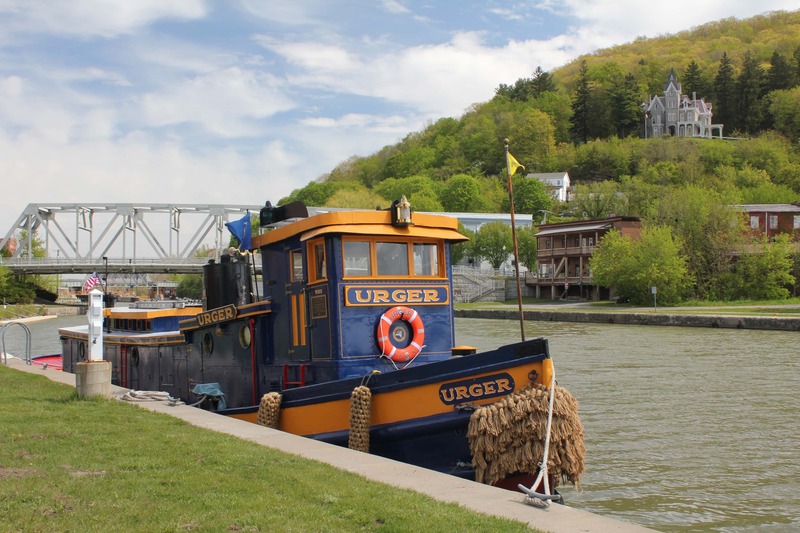 Whitehall Canal and Tug. Photo by Lesley Dixon. 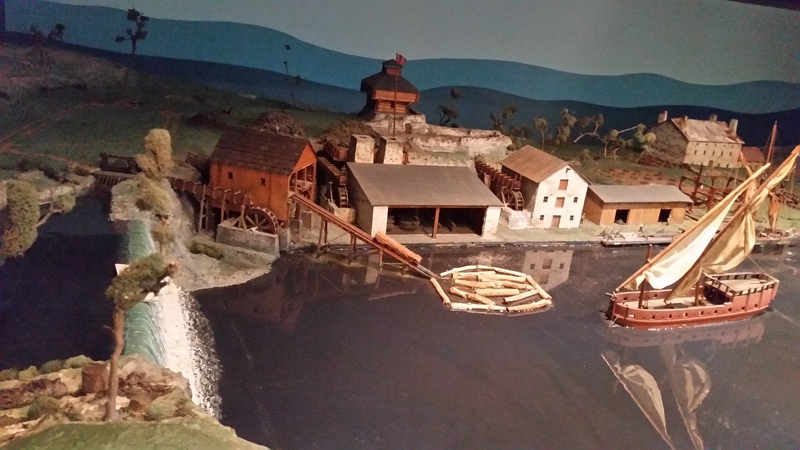 Diorama of Skenesborough at the Skenesborough Museum. Whitehall is known locally as the “Birthplace of the U.S. Navy.” It is one of several places that holds claim to such a title. The U.S. Navy traces its lineage to Philadelphia, the seat of the second Continental Congress, where a resolution was passed on October 13, 1775, creating the origins of the Continental Navy. Other claims include Machias, Maine; Providence, Rhode Island; and Marblehead, Massachusetts—but none of these predate the naval action that took place beginning on Lake Champlain in May 1775. Nevertheless, the U.S. Navy does not recognize Whitehall’s claim, noting these operations were under the authority of the Continental Army. None of this dissuades the people of Whitehall from defending their title as the birthplace of the U.S. Navy. On May 11, 1775, Benedict Arnold and Ethan Allen raided Skenesborough with the aim of commandeering some of Colonel Philip Skene’s ships. Skene was away in London when the Rebels seized Skenesborough. As Skene was a Loyalist, many of the locals were not too fond of him—so they looked the other way when Arnold and his Rebels helped themselves to a few of Skene’s goods. During the raid, Arnold and Allen captured Skene’s two-masted ship Katherine. With little effort, they then captured the British-held forts Ticonderoga and Crown Point. Arnold renamed Skene’s ship USS Liberty and embarked on an assault on the British shipyard at St. John, Quebec. On May 16, the ship was stalled due to lack of wind north of Isle la Motte, so Arnold and 35 men led the assault in small boats. After rowing all night, they attacked the fort at St. John, capturing the sloop George and renaming it Enterprise. The two warships gave the Rebels control of Lake Champlain. It was natural that Arnold would take advantage of Skene’s community to expand the Rebel fleet. Skene had erected a forge, built and ran several saw mills, constructed roads, and built ships. Several additional ships were constructed for the transport of troops during Montgomery’s and Arnold’s 1775-76 Invasion of Canada. Arnold returned here in 1776 to construct several additional ships that would take part in the 1776 Battle of Valcour. The USS Liberty survived all the action at Valcour and was one of the ships that the Rebels used to escape Fort Ticonderoga in July 1777. When the Rebels retreated from Fort Ticonderoga, they disembarked at a portage road below Skenesborough Falls, where bateaux (oversized rowboats) were prepared to take the Rebels along Wood Creek, where they would travel on to Fort Anne. Some troops stayed in Skenesborough to unload the mountain of supplies carried out of Fort Ticonderoga. About noon, the first of Burgoyne’s ships, sailing single-file down the narrow waterway, encountered the retreating Rebels. Anticipating Burgoyne’s eminent arrival, the troops set fire to much of Skene’s settlement, including the mills, storehouses, and the remaining bateaux. The Rebels then quickly retreated to guard the rear of the retreating troops. The Rebels had destroyed Skene’s settlement. Of the hundreds that escaped Fort Ticonderoga, Burgoyne had taken 30 prisoners. Burgoyne dispatched the 9th Regiment of Foot to catch the fleeing Rebels while he settled into the home of Philip Skene, the only building that remained after the fire. Start track 16 as you enter Whitehall and cross over South Bay. Historic Grounds. Serving homemade baked goods, breakfast, and sandwiches in a beautiful historic building. Don’t miss the Sunday brunch. 142 Main St, Whitehall. “The Continental Congress’s resolution to procure two armed vessels, adopted in Philadelphia, Pennsylvania, on 13 October 1775, was the original legislation out of which the Continental Navy grew. Within a few days of that vote, Congress established a Naval Committee, which directed the purchasing, outfitting, manning, and operations of the first ships of the new Navy, drafted naval legislation, and prepared rules and regulations to govern the Navy’s conduct and internal administration. Philadelphia was also the port where the purchase and outfitting of the first four vessels of the Continental Navy took place.